FYI- I received a copy of this story in exchange for a honest review. Good reads: Following their panicked escape from Wakefield, Astrid Chalke, Max Fisher, and their friends find themselves adrift and on the run in western Massachusetts. After picking up a young thief with a complex philosophy, and dealing with the pains of prescription drug withdrawal, they make their way to Boston. 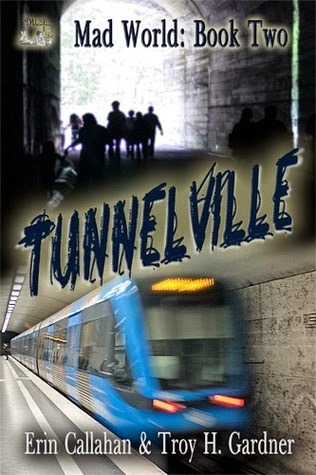 Drained by a long trek to the city, the damaged teens settle in an underground tunnel community—a city below the city that appears to lie on the fringes of both the world above and the world of magic. Among the eccentric tunnel folk, they encounter the fabulous Angie DeVille, a self-made hipster and socialite who takes them under her neon wing and envelops them in her breathless and fast paced life. In a nut shell: Ok, so i'm going to say I liked this book. It was interesting to read, and because I promised a review I read it 3 times to really get a feel for it. I took a bunch of screen shots, and points that I really wanted to make about what I liked and what confussled me. Right, so I know its American lit, and occasionally I found some of the use of words a little confusing, I found myself having to google what they actually meant. Oh, and the amount of times the word 'Dude' is used, I'll say its better than the British version, 'Brov' but do people really use the word 'Dude' that much? I'm actually curious. Another thing I have to say is Angie, her use of the word 'Darling' all the time. I liked how we learn more in this book about the characters, for instance, "Az is a biter." Characters: They're so many characters to keep up with in this book, and I was really impressed how well the authors made sure they all had a voice. Eugine was a little but weird, I hoped he'd have a bigger role, I enjoyed hearing from him. Astrid is 'nice' in this book, I wanted to see more from her and she kept me amused and interested. I loved how well she interacts with the others, and the whole Teddy Vs Astrid thing. It made me smile on many occasions. Max, though. Max. I'm not sure about Max. He reminded me a little of a wet fish. I liked his voice and everything, and he interacted well, but he wasn't as interesting as Astrid. I think its just a preference thing, but I wanted to slap him a few times, but that's a good thing if you look at it from an optimists point of view, it means he's lifelike and causes reactions. I'm going to go back to Angie, and how much I hated her from the second we met her. I don't know, maybe its the whole Londoner thing, or whatever, maybe it was done on purpose, but I really hated her. So very much. Teddy as always, I couldn't connect with. But that's more of a personal thing than a character thing, and I think he's funny at times, seems like a real bucket of fun. Laura, she confused me at times, but I think I really wanted to know her more, know what she liked, she she didn't. She interests me. Azrael, I love. I really do. Azreal is such a great character, and one who in actual life I would actually love to know. Lawrence, was a little weaker, but I really liked the interactions. Plot: This is something different, and I really liked hearing about the city, as I've never been to America. I wondered what a T was, I wondered if it was a T-shirt, or golf, or a drink, when they were 'riding the T' I was like, huh? So it took me a while to click with that, but once I did I thought it was a really good, and I really enjoyed this book. The heartbreak, the comedy, the shocks, the twists, yep, this book was a 4* for me. Over all: I think I've made my point. I liked this book, and I enjoyed it. Notes: So, I can't wait for number 3.